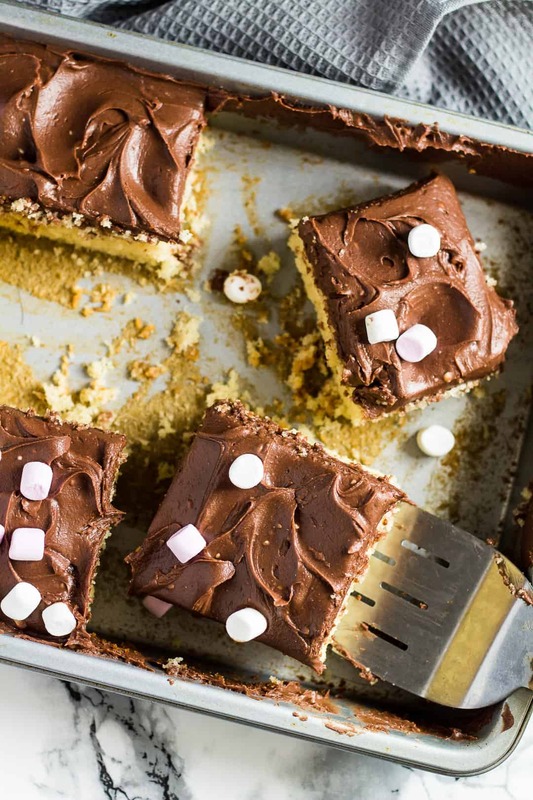 Vanilla Sheet Cake with Chocolate Cream Cheese Frosting – Deliciously moist and fluffy vanilla infused sheet cake topped with a rich and creamy chocolate cream cheese frosting, and sprinkled with mini marshmallows! 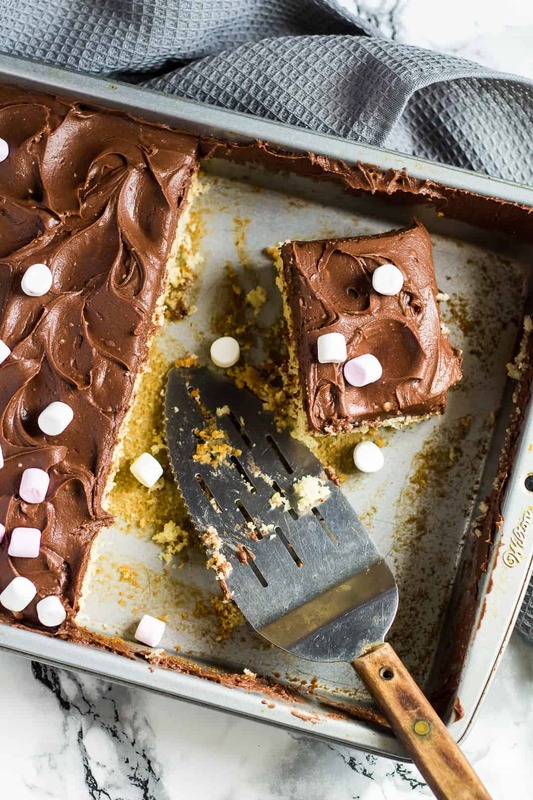 You’ve tried and loved my Perfect Vanilla Sheet Cake and my Chocolate Sheet Cake, so today I bring you a new sheet cake to impress your guests with – Vanilla Sheet Cake with Chocolate Cream Cheese Frosting! If you love traditional vanilla cake, and chocolate cream cheese frosting, then this cake is for you. This cake has definitely become a favourite in my house. incredibly moist, and so fluffy! Forget fancy layer cakes, this vanilla sheet cake is the perfect cake to serve at any party or special occasion. 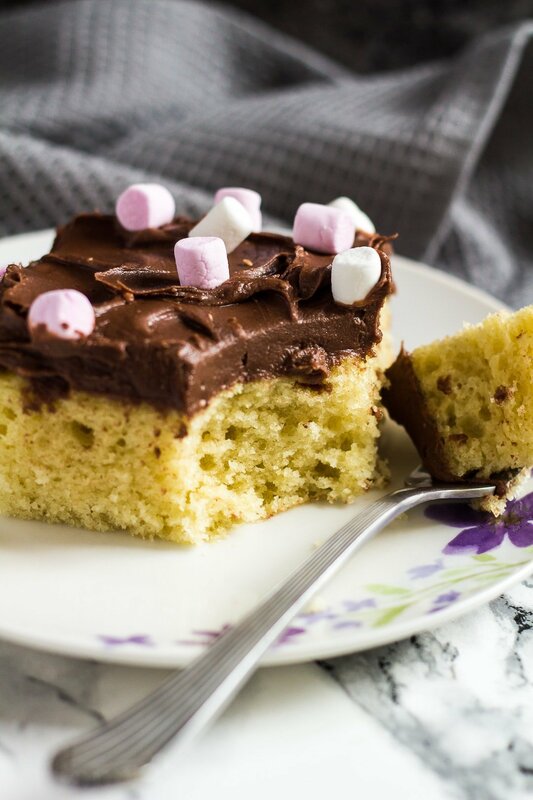 It’s such a simple cake to make, yet it looks so impressive – everyone will love it! This cake will serve 12 big slices, or about 16 smallers slices. Plenty to feed a crowd! If you happen to have leftover cake, it will keep fresh, covered, in the fridge for up to 3 days. Wanna make this cake a day in advance? 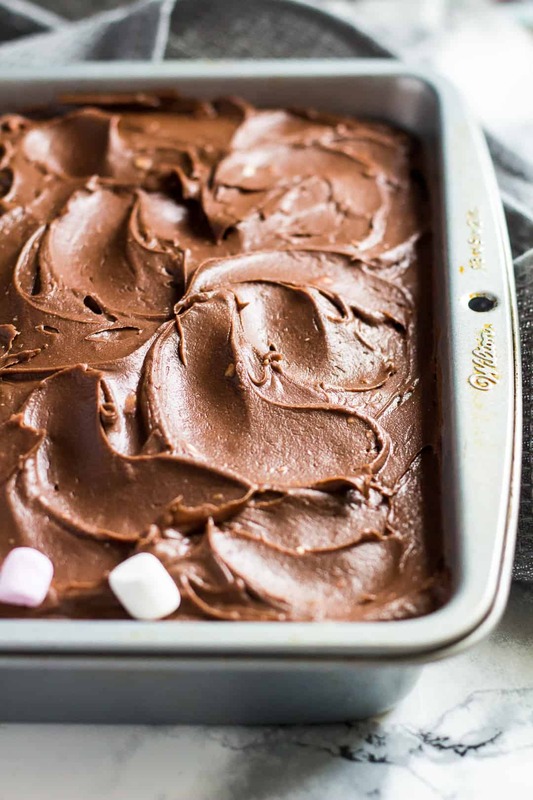 Cover and store at room temperature, and keep the frosting in the fridge until ready to use! 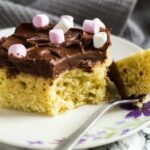 More sheet cake recipes to try next! 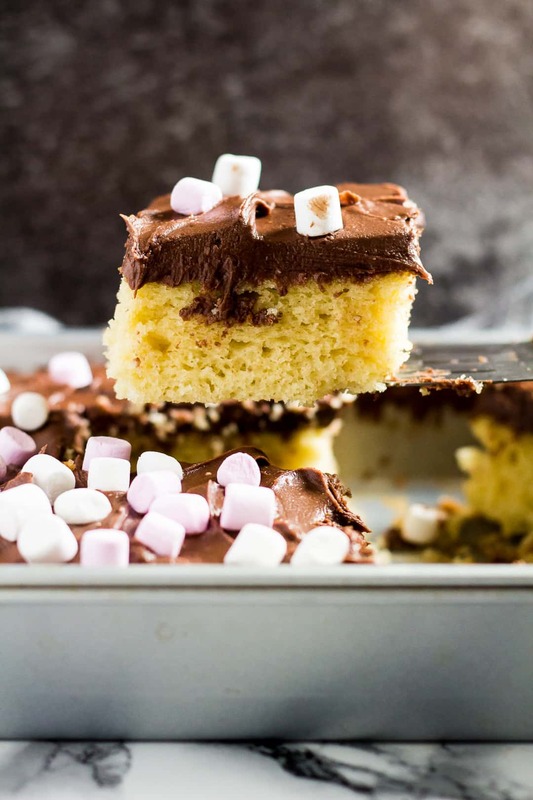 Deliciously moist and fluffy vanilla infused sheet cake topped with a rich and creamy chocolate cream cheese frosting, and sprinkled with mini marshmallows! Preheat the oven to 180C/350F/Gas 4, and grease a 13x9-inch pan. Set aside. Whisk together the eggs. Add the sugar, and whisk until combined. Add the vanilla extract, oil, and yogurt, and whisk until combined. Gradually fold in the dry ingredients. Pour the batter into the prepared pan, and spread out evenly. Bake for 20 - 25 minutes, or until a toothpick inserted into the centre comes out clean. Allow to cool completely in the pan on a wire rack before frosting. Using a handheld or stand mixer, beat together the cream cheese and butter until smooth and creamy. Add half of the icing sugar, and beat until smooth and combined. Add the remaining icing sugar, cocoa powder, vanilla, and milk, and beat until smooth and spreadable. Add more milk if needed. Spread the frosting evenly over the cooled cake, and garnish with your favourite toppings. Slice and serve! Leftover cake can be stored, covered tightly, in the fridge for up to 3 days. Frosted or unfrosted cake can be frozen for up to 3 months. Thaw overnight in the fridge. This cake can be made 1 day in advance, covered, and stored at room temperature. 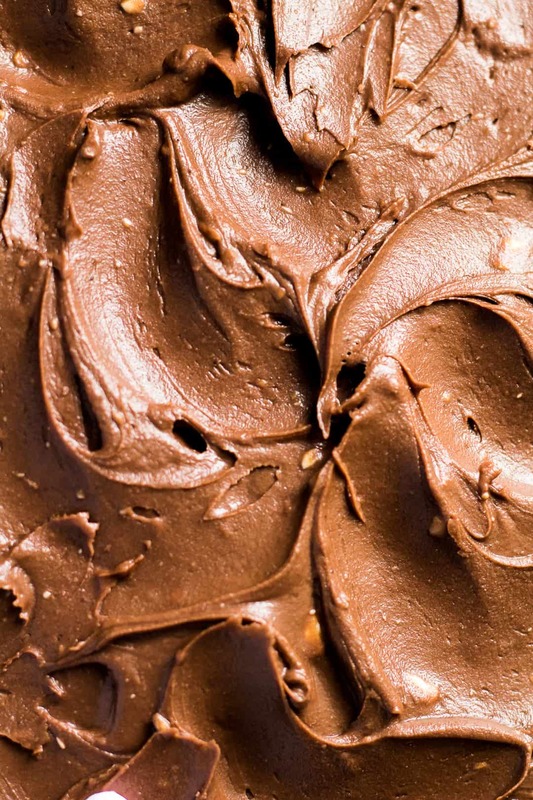 Cover the frosting, and store in the fridge until ready to use. I can never resist a good cake and this one looks really good! Plus I’m all about ease of decorating – sheet cakes are the best! 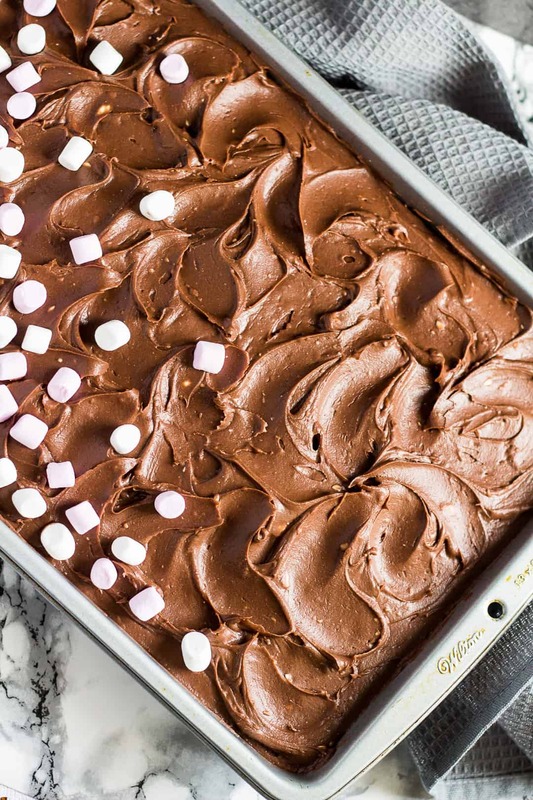 The Southern part of me loves a good old sheet cake and your recipe looks Devine!